This summer our family spent time and money on the things that were important to us. We had a few trips to the West Coast and a few camping trips, and as I am writing this we are on our way to our first rodeo! These expenses matched our family value of ‘freedom’. We had been looking forward to these trips and financially planned for them together. We were all on board earlier in the year when we decided to save for our holidays. However, our family’s relationship with money has not always been peachy keen. In my book, I share much more about my money story and journey, starting with my marriage breakdown and having to recover from being left financially naked. 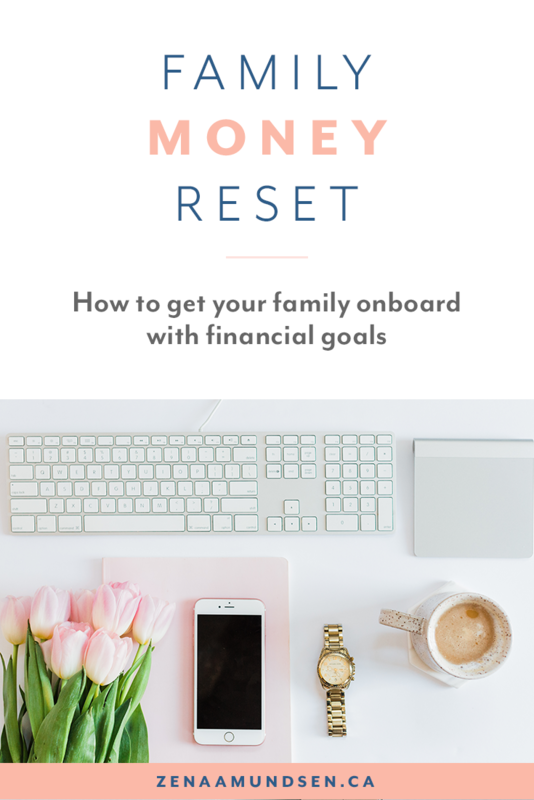 I also write about the steps I took to come back stronger and how I created value-based spending that aligns with family. Value-based spending refers to spending your money on those things that are truly important to you. Once you have set aside money for the crucial items first, like emergency savings, and all the basic needs like food and shelter, then you can direct your financial resources so that your spending matches your values. This is where my September Reset comes in. Fall is the perfect time of the year to hit reset and get your family ready for the next season of bills and expenses. The weather is perfect, the leaves are turning and you might be ready to settle in after a summer of fun. In fact, this summer’s spending might leave you feeling a little overwhelmed with the upcoming fall expenses. 1. Call a family meeting and list what is important and the highest priority. For example, this might be the Christmas vacation you planned, the upcoming sport team expenses or paying off extra debt that has been haunting you. Put this priority on paper and post it on the fridge. 2. Review your online banking/credit card statement. Do your spending and savings habits match your family’s priorities? Is there a disconnect? Do you need to reassess and realign? 3. Now you make your money work to match your values. Adjust your cash flow system to include a savings bucket that will be directed to your main priority. If you are needing a cash flow system that works and leaves you feeling empowered with an abundant mindset, read chapter 5 of my book, The Heart of Your Money. 4. Schedule family check in’s to track and stay focused on your progress. This can be the perfect place to bring a collective and collaborative approach to our lives. When our values are shared within a family, we build a positive, healthy, and thriving unit with the benefit of being able to prioritise effectively. Your spending should be a reflection of what you truly value. However, it is common to fall out of step with what is important to you. This can happen slowly and over time if there is not a conscious effort to pay attention to where your money is going. When I meet with people for cash flow planning, it is generally because they have a feeling of wandering with their spending. This can happen for a number of reasons—stress, a feeling of scarcity, and fear, or something as simple as being busy and not being mindful. No matter the reason, we all need a reset sometimes. How to Declutter to Create Abundance Using Money to Create More of Your Most Valuable Resource: Time!